It's time to close out the month of October with another installment of Port Road Trips. This time we are leaving the A&S and Safe Harbor Dam behind and striking out on our own on the road to Perryville. 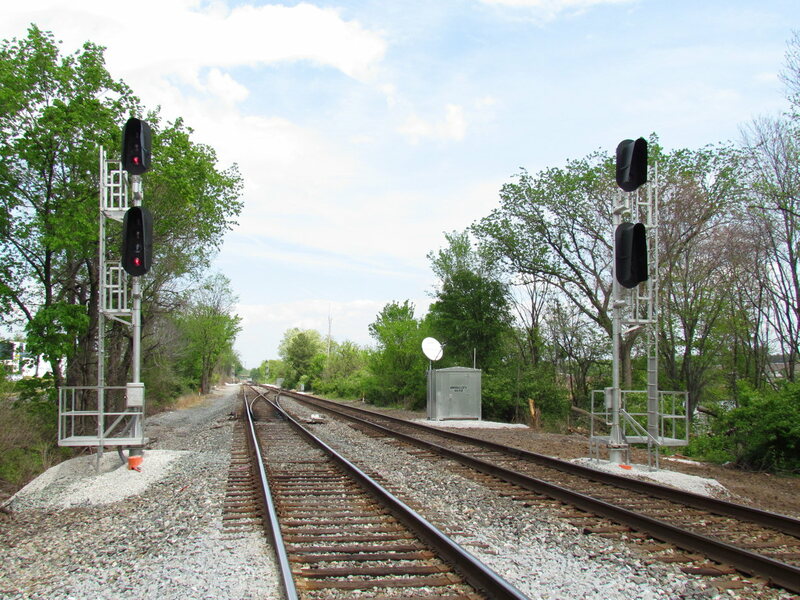 Having passed CP-HARBOR this section will cover the next intermediate signal at MP28/29, the west end of the long signaled siding at CP-McCALLS, the crossover at CP-HOLTWOOD and finally the MP23 automatics in advance of the east end of the signaled siding at CP-MIDWAY. The Milepost 28/29 automatic is split between Milepost 28 and 29 due to the signals being arranged around a curve to improve sight lines. The C290 eastbound automatic has a lower head | for diverging movements at CP-McCALLS. It also features an 'SP' plate that stands for Slide Protection. 'SP' plates were a PRR thing that called extra attention to signals that protected slide fences. Any train passing an 'SP' signal at restricted speed had to look out for falling rock. 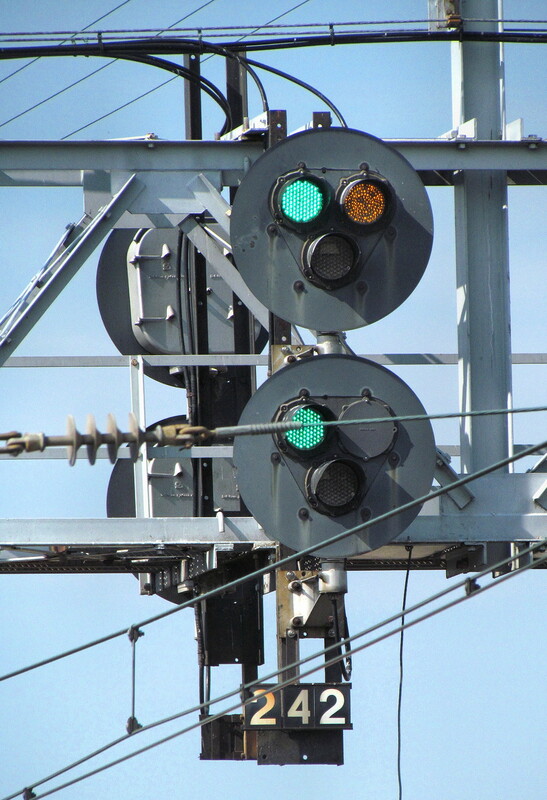 In 2004 the C287 automatic has already been replaced by a Conrail style color light. This has taken place early in the NS era when the Harrisburg area signal shop was still using US&S NR style color lights instead of Darth Vader tombstone signals. C287 is shown here displaying Approach for a stop at CP-HARBOR. 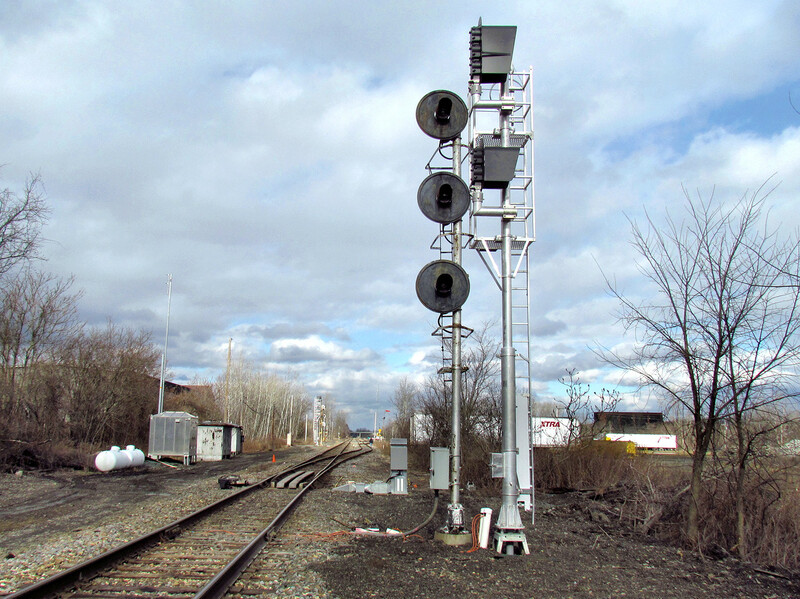 This pair of split signal masts were ultimately replaced by a single bi-directional mast after the NS resignaling project. The lower head is not for diverging movements at CP-HARBOR, which if you recall were Restricted speed, but for the short block length between CP-HARBOR and CP-WEST HARBOR. 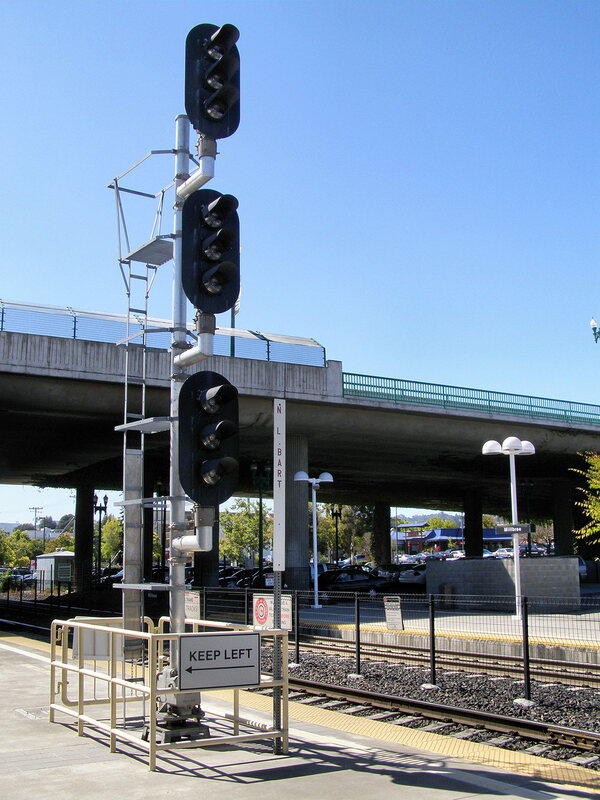 The new signal was still outfitted with an 'SP' plate just like its predecessor, but was not given a coat of black paint on the upper half of the mast in the Conrail style. CP-McCALLS is one of the few Conrail interlocking names that contains a lower case letter in the name. 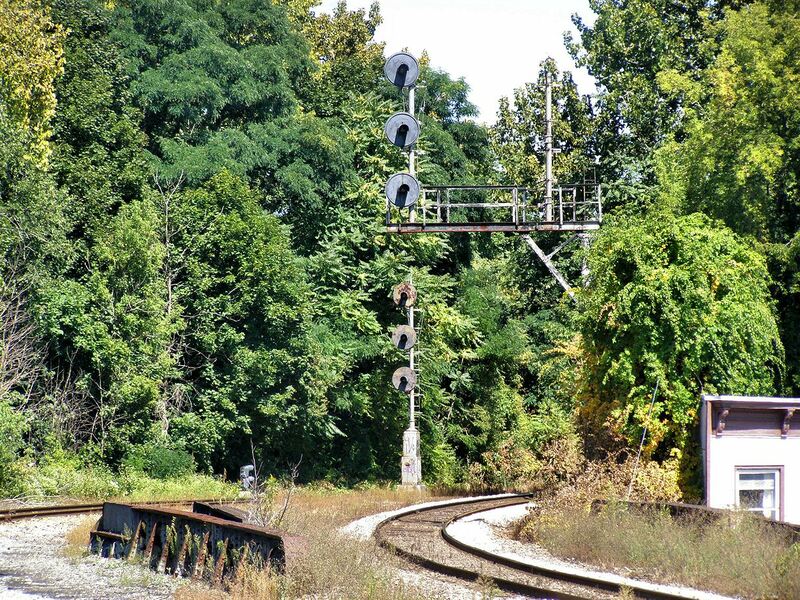 Like I said it is located at the east end of a long, 4 mile, signaled siding. This contrasts with the two short restricted speed sidings at Pilot and Harbor. 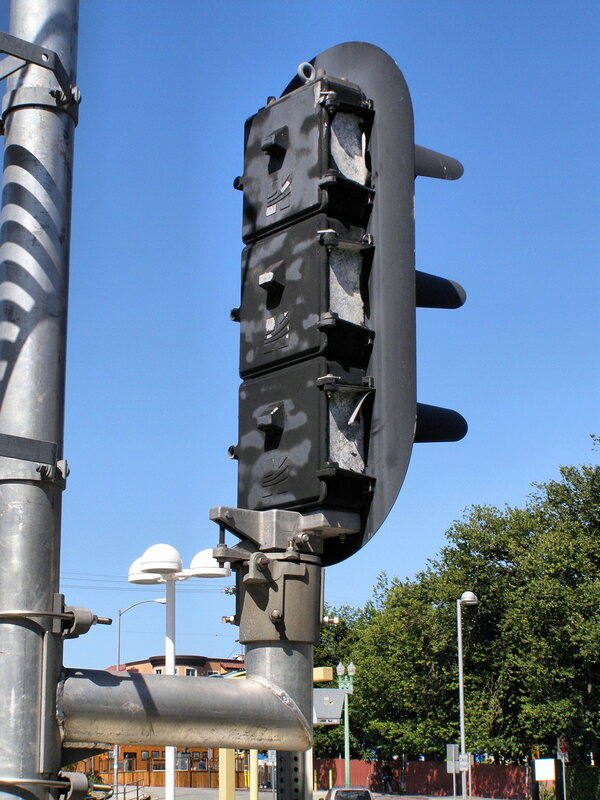 Here we see the interlocking and the eastbound 246L signal. CP-McCALLS features a medium speed diverging route and as such features a full PRR PL mast signal with a lower head containing both | and / positions for Medium Clear and Medium Approach. 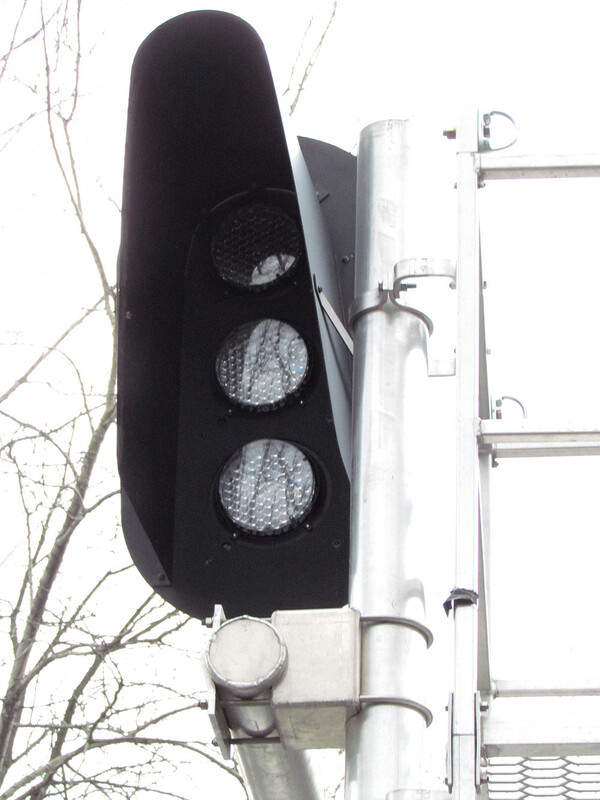 Stop and Proceed is displayed using the central marker in place of a Restricting \. This economic "style" would later be adopted by Amtrak. Because CP-HOLTWOOD is back-to-back with CP-McCALLS the lower head | was also used for Approach Medium. CP-McCALLS featured an old school PRR remote interlocking relay hut. Until its resignaling in 2009 this section utilized the US&S 504 code system delivered via the high density plastic wrapped telecom cables. The relay hut is constructed from sheets of galvanized steel on a concrete base. This hut survived the re-signaling with the new relay box placed on the river side of the tracks (that floods frequently...). The #245 switch machine is a US&S M23 dual control electric model. 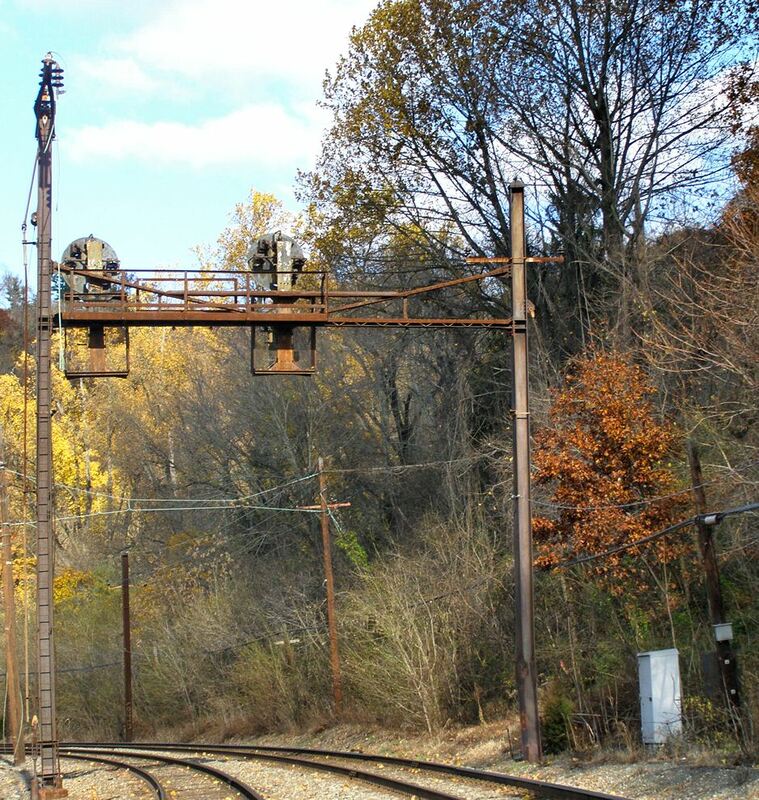 Here is the westbound catenary style position light signal gantry with the 246RB (siding) and 246RA (main) signals. No surprises here. Siding signal has a lower head for diverging movements and the main signal has a "hanger" type marker light for call-on movements. 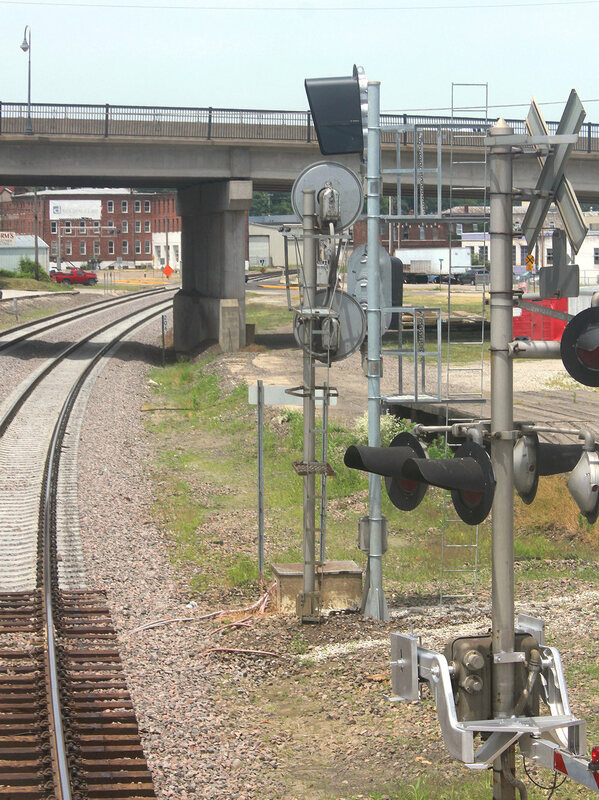 The signals would not get any new paint before they were replaced by an NS cantilever mast at the same location. CP-HOLTWOOD was located adjacent to the Holtwood Dam, which back in the day was paired with a decidedly less "green" coal fired power station that required shipments of coal via rail. CP-HOLTWOOD featured a single "trailing" crossover that partly split the long controlled siding into two halves. 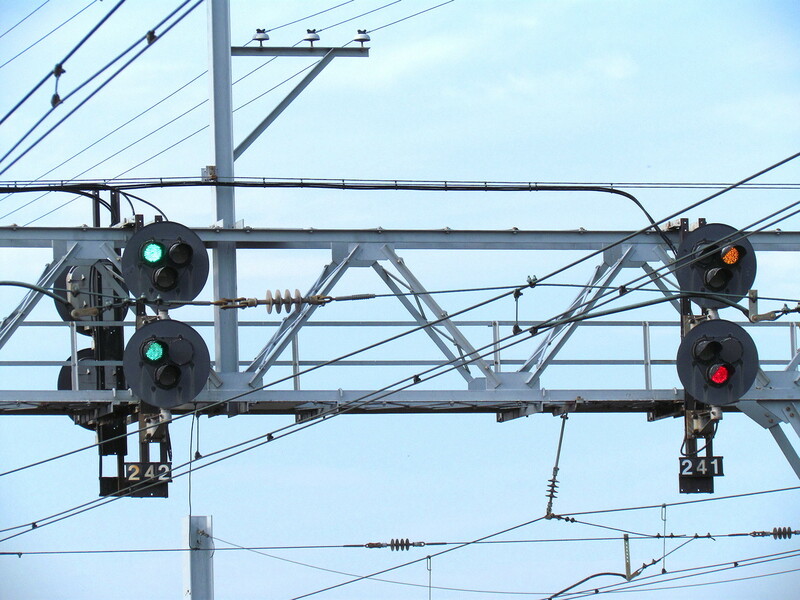 Here is the southbound catenary style signal gantry with two PRR PL signals. The 242L signal on the main track features an old style lower head with the backing applied only to the | indication for Medium Clear. The Medium Approach / was not provided a backing as it was originally displayed Slow Approach before the 1956 addition of Medium Approach. Like CP-McCALLS both the 242L and 238L use a lower head central marker light for Stop and Proceed indications, instead of a Restricting \. 'SP' plates make another appearance on both the 238L and 242L signals. 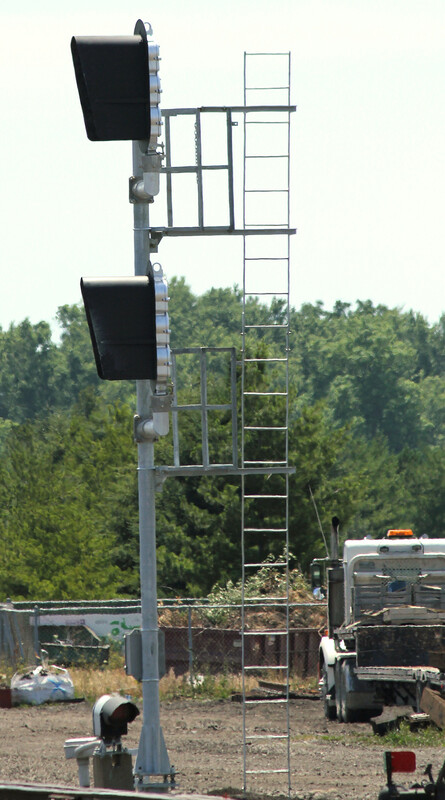 Here is a reverse view of the eastbound signal gantry taken in the fall of 2007. The signal bridge looks a bit like a hack, but it was in place as far back as the 1980's. 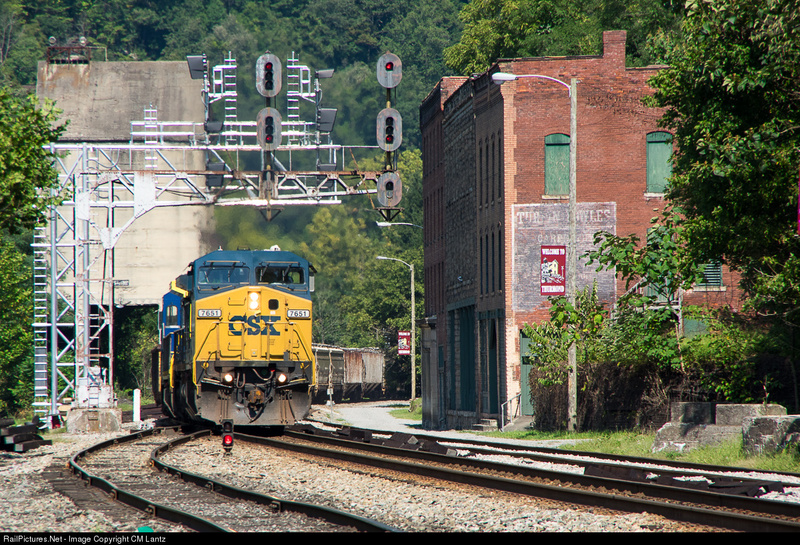 I guess it is no surprise that CSX is not above ruining a Nationally Registered Historic Place. 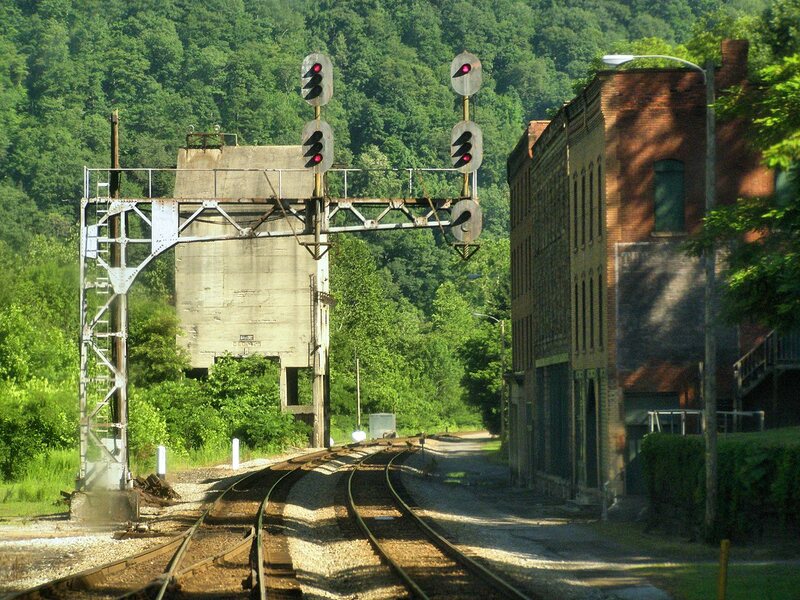 I've been waiting for the re-signaling project on the C&O Main Line to reach Thurmond, WV for some time now and about a month ago (right after my last new post actually) I saw that a new cookie cutter Darth Vader cantilever with Seaboard signals had gone up adjacent to the preserved "downtown" of Historic Thurmond, WV. 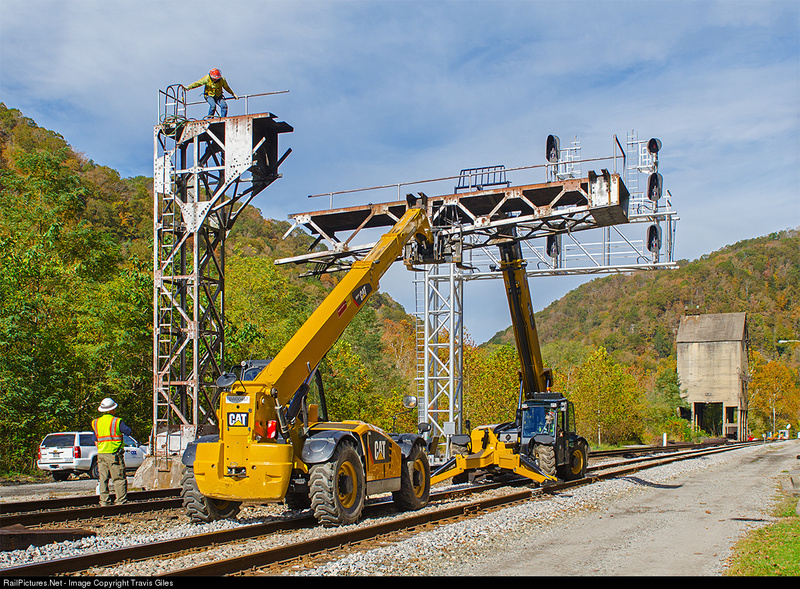 Seeing as it can take 6-8 months for the old signals to fall once the new signals go up, I was shocked when I saw this photo of the old cantilever getting chopped down without so much as a by your leave. 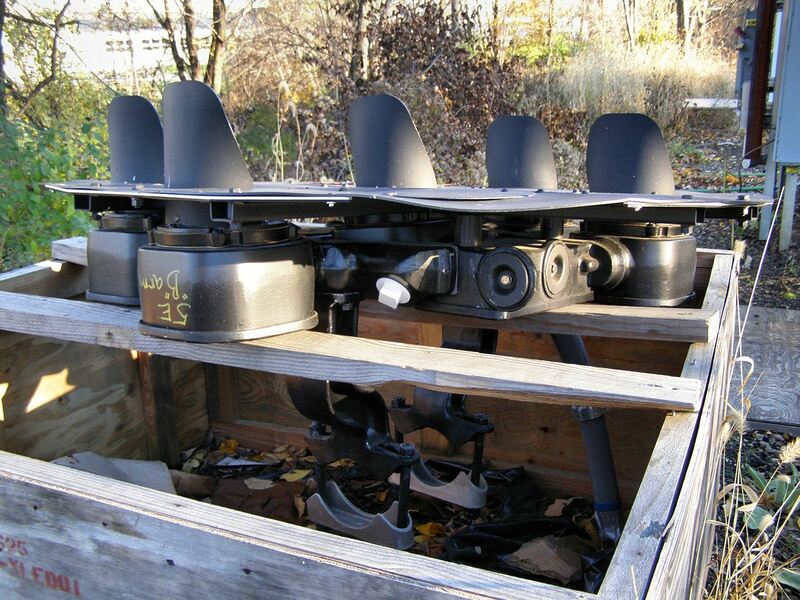 At least NS was good enough to donate one of the PRR signal bridges on the Horseshoe Curve to a museum. That C&O Cantilever was as important to the character of that streetscape as the coaling tower. Anyway, while we are discussing news items it appears that the D&H re-signaling has hit CPF-485 at the Schenectady Station. 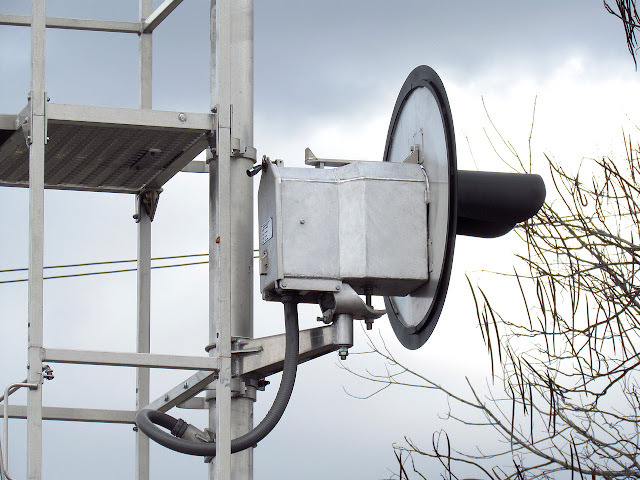 The old cantilever signal that used to stand on the main track was replaced a few years ago by a new mast type signal that will not be spared the axe. Replacements are soulless LED Darth Vaders. 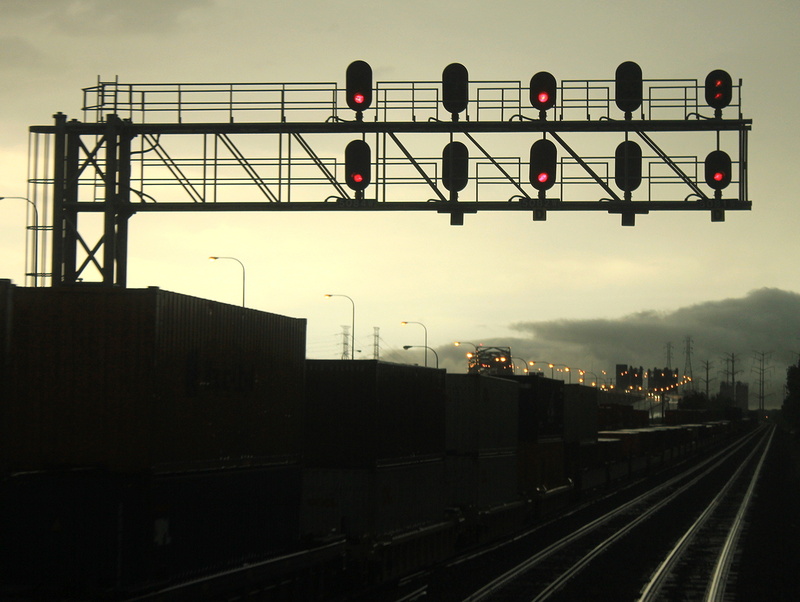 It's not really in dispute that North American railroad signaling is currently suffering from a lack of diversity. However with all the legacy signaling still floating around I figured it would be best to illustrate the lack of diversity of a handy dandy guide. I'm going to proceed in alphabetical order so you can see for yourselves. Non-PRR NEC - LED target color lights. 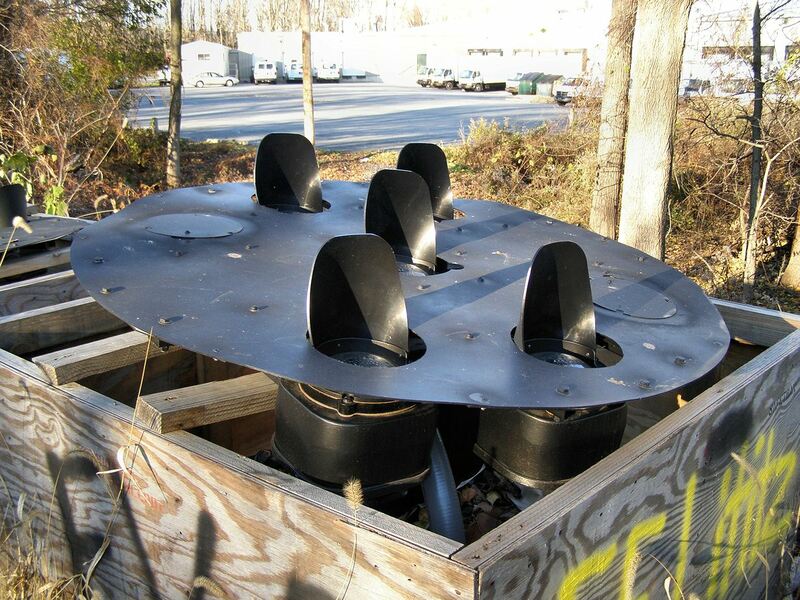 Non-Safetran Modular housings. BNSF: Safetran "Darth Vader" heads with silver painted reverse. 2 heads with three lensed lamps most common. Caltrain: Color light signals with square modular units. Primary - Safetran "Darth Vader" type heads with bare LED lamps. Secondary - In house "mystery" type searchlight. CSX: Safetran "Darth Vader" heads. 4 lensed lamp heads used for Lunar White restricting indication. Today I have a few photos taken in that brief period of time when the relays are still fluttering about and signals, at least the old school variety, can do some rather..."nonstandard" things. Today we begin on the SEPTA reading trunk line between the Center City Tunnel and Wayne Junction. This was re-signaled around 1990 and while heavy use of solid state logic was just around the corner, northeast commuter lines were still hitting things up in the traditional way. Here we see the LED upgraded 24 automatic on track #2 displaying Clear G/G New York Central style. Woah...now the 24 auto is totally off the reservation! I will say that I wish I knew what about LED arrays make certain ones fade out and others exhibit more binary behavior. Alright, time to lift the veil. Here's a video of the signal progression. Note the relay lag actually lasts for a second or two. 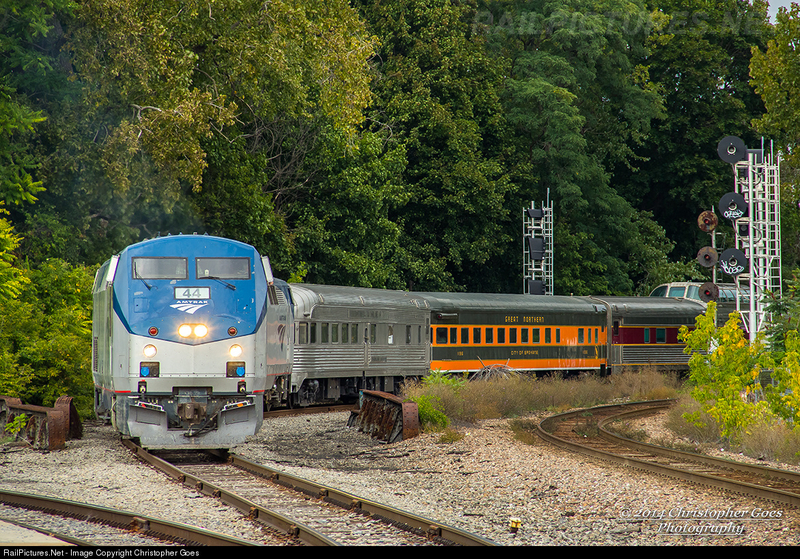 Here is an example from a recent trip on the Capitol Limited on the former Conrail Chicago Line just out of Chicago. Here the MP 508 automatic is in the process of flipping from Stop and Proceed up to Approach right after our train passed by. This is because there was a westbound Wolverine Service train waiting for us to clear the single track at CP-506. One of my favorite signals with wonky relays is the southbound Southern cantilever at MIDLAND interlocking in Gainesville, GA. 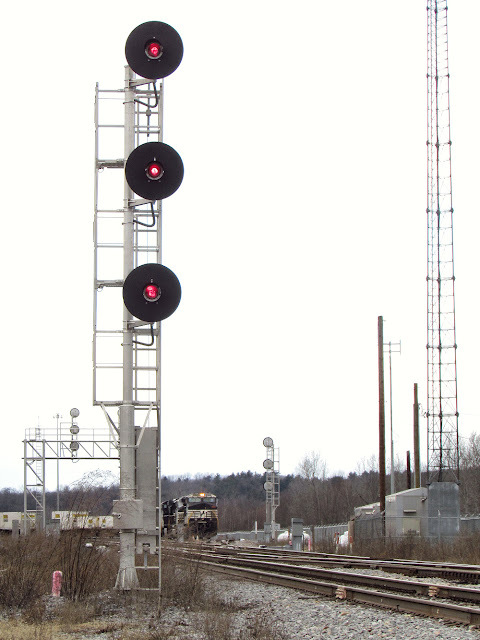 This signal has some serious Conrail envy because when trains pass it at Approach Diverging, it drops first to R/Y Diverging Approach before finally going R/R. I say Conrail envy because this is somewhat typical on plants where R/Y is used for Restricting. In this Caught on Camera special you can first see the signal upgrade from Approach to Approach Diverging, then get knocked down in the manner I just pointed out. I'm sure I have a few more examples of this sort of behavior captured on still or video, but I'm going to leave it at these for now. If you have some fun examples of relay logic feel free to post them in the comments.